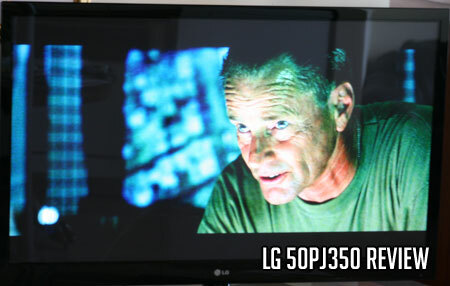 The LG 50PJ350 had no problem with this dark scene from Black Hawk Down. The 720p plasma has good depth but lots of glare. 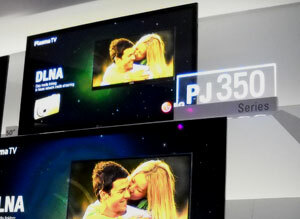 The 50PJ350 is the lowest price and feature set offering from LG's plasma lineup for 2010. This plasma offering has a unique place in today's TV world with a resolution of 1366 X 768 or 720p or 1080i. We dont have anything against 720p since much broadcast HD TV programming likely comes through in this resolution – as long as the 720p picture quality is excellent.This plasma will compete on it's looks, plasma picture technology, some nice features from LG, and certainly price. 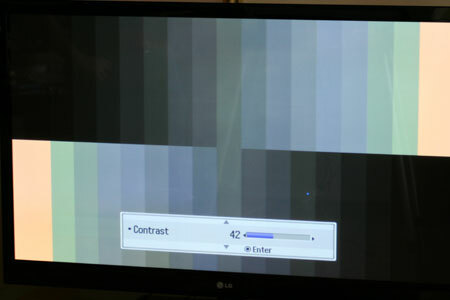 There is considerable and inconsistent color shift at varying brightness levels in the PJ350 plasma TV as shown in this shot of a split gray scale during calibration. The color shift will show up during viewing content especially in light and white content. For an inexpensive plasma offering, there are extensive calibration control options. 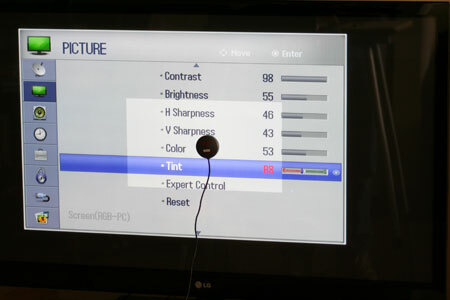 One of the most important tips we can give you about this TV is to turn the Sharpness control down to between 10 and 20%. Higher Sharpness increases false edges and motion artifacts with this TV. The fix is easy and has no side effects. 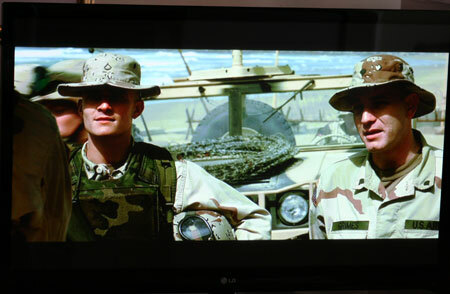 This shot from Black Hawk Down shows nice depth, but the TV light and white colors were inconsistent. 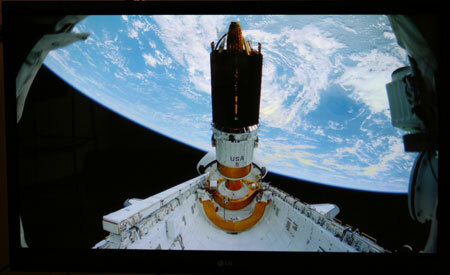 Contrast and black levels were much less punchy with the PG350 plasma than the 1080p units. Blacks struggled even with HD material. There was a slight milky quality to black appearance. Contrast was not as robust as measured post calibration ANSI checkerboard pattern 1125:1 – worse than many LCD TVs we've recently tested. We decided to leave the contrast setting at an unusual post calibration 100%. Was the picture quality poor? No, not by any stretch. It was decent, but lacked punch in colors especially from lower resolution 480i material. With HD 720p and 1080i material color information improved significantly. Other weaknesses are that there is much screen glare even though LG claims a new technology called "Skin Glass" system to supposedly help with internal reflection. The feature did not get the job done on this plasma. On the positive side of this considerable glare issue is picture depth. Picture depth is a real strength of this TV especially with HD content. This is a result of the same "Skin Glass" technology. Another new feature called "Intelligent Sensor" is supposed to help with room light condition adjustment. The problem for us is that we already have contrast peaked at 100%. Another way to put this is that the TV cannot give you any more brightness when it's set to 100% contrast. So in a room with any ambient light at all the feature is meaningless, which pretty much makes it ineffective for anything at all. A shot of a storm brewing in from HD Blu Ray content. Video Aspect Ratio Sizing: 16:9, Cinema 1, 4:3, Set by Program. Inputs: 3 HDMI, 1 RGB PC, 1 RS232, 1 component, 1 USB, no Ethernet or other Internet connectivity. Aesthetic Considerations: The PJ350 is a great looking black gloss TV with a 2" depth and 1 inch bezel frame on the sides. The top bezel frame is 1 and half inches. The included swivel table top stand is also black gloss and swivels to about 20 degrees left to right. My one complaint with the appearance of the TV is the gray screen when the TV is off. I prefer a black screen. The menu system is well laid out and easy to use. Remote Control/Menu Funtionality: This is an area of solid strength for the PJ350. The Menu is easy to navigate and simple to understand. It's also easy to see with a big display and in color. There is a Q.Menu button as well to allow quick access to Aspect ratio, Picture Mode, and Sound Mode features. The remote control is logically laid out with big buttons with a backlight. It's also attractive and ergonomically sound. Audio Output and quality was very impressive in the 50PJ350 a noted improvement over prior LG models. Even at 10% we could still hear the inbuilt speakers discernibly well from 10 feet. Clear Voice II seemed to work much better than the prior Clear Voice feature. Mid range was was noticeably boosted to enhance voice frequency, so we felt the feature worked well. Rarely have we tested a TV that concentrated on such powerful volume output and especially in the high to mid range. The sound quality does present a hollow and slightly tinny character at times. If price is your bogey then this value oriented TV could be your lackey. At $719 you will find nothing in LCD or LED comparing to this plasma in price. But alas, Panasonic and Samsung could not let the challenge go unchecked and both have 2010 720p plasma tv models that compete directly on price. The Samsung PN50C450 and the Panasonic TC-P50C2 are the two competitors. This LG offering has some slick features, a tight, thin, cabinet and good speakers. But the picture quality will likely be eclipsed by the Samsung offering. Review Equipment Used: Sony Blu Ray BDP-S1 High Definition DVD player, Sony DVP-S50 DVD player (480i), Digital Broadcast Television, Sencore Color Pro 5000, Sencore Auto Cal Pro TWC6500, Sencore signal generator. LG isn't abandoning the 720p HD specification for 2010. The PJ350 offers many of LG's core features in a slim, 2" case with a sub 1" bezel for a modern looking, feature packed TV at what should be an affordable price. The Intelligent Sensor feature will automatically adjust the brightness to match the brightness and color temperature of the room lighting. While these automatic adjustments sensors provide marginal energy savings we have found in the past that they sacrifice a calibrated picture to do it. Most viewers will be more concerned with picture quality than a slight power savings but if you want to trim a few dollars off the monthly power bill this feature can do that for you in a room that allows the TV to run at lower brightness levels. The PJ350 series plasmas use LG's "Skin Glass" system to both protect the panel and reduce internal reflections by reducing the distance from the outer glass to the filter by 70%. LG mentions these plasmas have a 600Hz Sub Field drive, really this is just a marketing term built around plasmas inherent resistance to motion lag. With LCD manufacturers talking about higher and higher Hz rates to reduce motion lag the plasma manufacturers had to come up with something more interesting than "plasmas don't have motion lag".